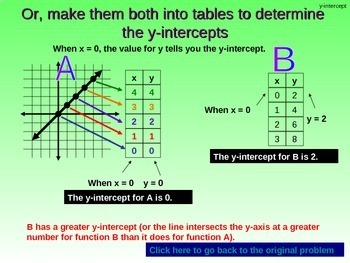 Comparing linear vs. nonlinear, slopes, and y-intercepts of functions. 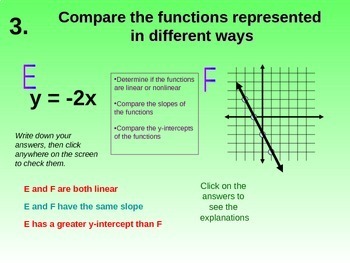 Functions are represented by tables, graphs, equations, and verbal descriptions. There are 4 examples, each with a different combination of representations. This PowerPoint can be used as a review, introduction, or lesson. It can be used in a teacher led whole group setting, teacher or student led small group, at stations, or independently. It is great for mainstream classes and resources classes. It can also serve as a resource for students and parents to use at home. This PwrPt is interactive. It guides students to write down their answers before clicking to see answers. 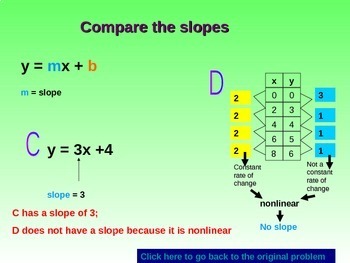 If students are unsure about how an answer was reached, they can click on the answer to see an animated explanation. Differentiation is built in to this PwrPt as students need only click on answers they are struggling with. There are also 2 ways to reach the solution for some problems. The last slide is left with just the start of instructions so teachers can adjust it to direct students to the next activity that fits in their classroom. 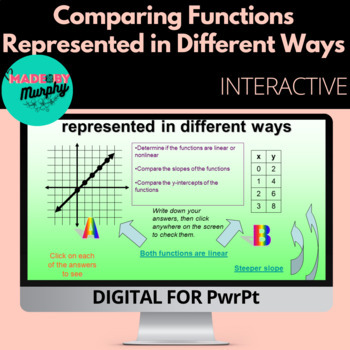 Teachers may want to print out the handout with lines to go along with the PwrPt as a way for students to have useful notes to look back on without having to copy down too much as they go through the PwrPt. Please be sure to rate & leave feedback for this product!